Do you know the Integral European Conference (IEC)? 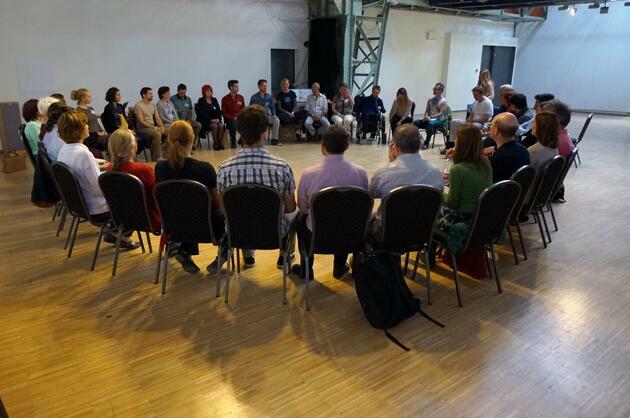 This is the 1st really European conference about The Emergence of Integral Consciousness. Having my own company called integrality I just had to be here… Lovely city, lovely weather and I’ve met a lot of interesting and lovely people. The conference with ca. 200 delegates itself was nice, and there where some really nice presentations. There was in depth exploration of many facets of integrality, showing the richness. About psychotherapy, ecology, economics, transformative communities, academia, medical political, leadership, gender, etc. Still I left with some mixed feelings. Maybe this illustration (left) shows that nicely. Somehow I had the feeling that a lot of the stories were not really integral and just too mind driven. What struck me the most was that even keynote speakers like Ken Wilber were talking in a way which just drains the energy. I clearly noticed the ‘energy’ going down after a lot of talks. A majority of presenters had the tendency to talk ‘about’ ideas, and in a detached abstract and generic way. There where some really engaging plenary talks such as the already 82 years old Hungarian philosopher of science, systems theorist, integral theorist, originally a classical pianist Ervin László. One of the most powerful presentations was given by the visually impaired Ole Vadum Dahl as he stated: “I’m not blind but can’t see”. It seems to me that not being able to see helps overcoming ‘aboutism’… Also John Thompson and Sean Wilkinson from Circling Europe illustrated the power of presence, being congruent in their presentation. They really showed ‘practice what you preach’. In my opinion integrality relates to the Spiral Dynamics turquoise and is all about integrating experiences and consciousness within yourself. As organiser of the conference Bence Ganti rightly puts forward in his presentation, this needs years of practice, working with body, mind & soul, overcoming your shadows and dominant ego. In my opinion being aware of the importance of presence and challenge speaker to develop that is step one. To understand the deeper meaning and challenges of integration I can recommend reading Presence: Human Purpose and the Field of the Future by Peter Senge, Otto Scharmer, Joseph Jaworski & Betty Sue Flowers. Bence and other conference organisers already tried to bring in, in addition to the mind focus, more body & soul focus into the conference. For instance, they introduced meditations, singing and a tribal evening including food, and dancing. This helped to ‘open the hearts’ and ‘sink in’. Step two, as I see it, would be to integrate these elements more into the core of the conference, and not as add-ons. For instance, start with exercises which make delegates really connect to each other, such as dancing and exchanging in duo’s. Not easy given the context of a conference, but in my humble opinion that would be really transformative and integrative!